Star Wars Parties can get pretty elaborate. So we are always excited when we have food that is Star Wars themed, fun, yummy AND easy to make. 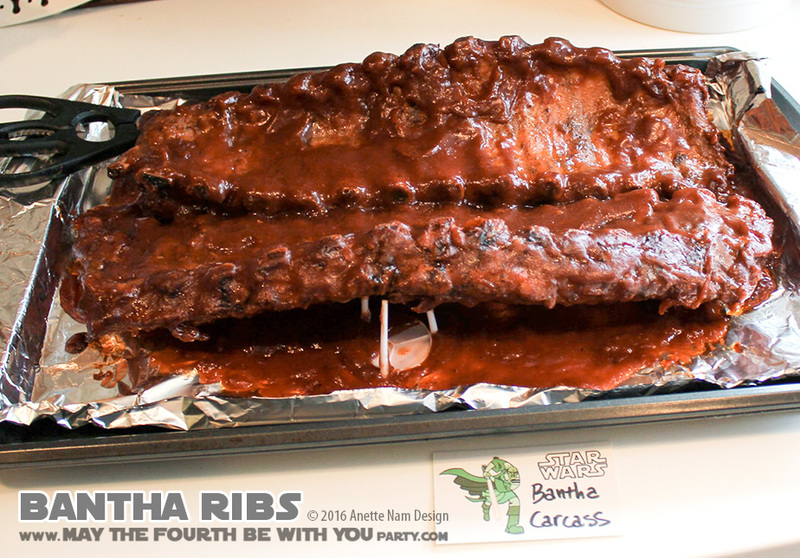 And what can possible be more fun, yummy and easy than a Bantha Carcass…. erhm. We tried to prop the 2 slabs up so it looked like an opened rib cage – but were somewhat unsuccessful at it. If we do this again, I’ll plan the presentation better. Placing it on something that looks like sand would be really nice (since Sand People are well-known for keeping domesticated Banthas). Cornbread crumbles seems like a pretty good option. Our favorite is Carson’s Ribs in Chicago. Unfortunately, that’s nowhere near where we live (so the ribs in the picture are NOT from there). But if you are lucky enough to live in the Windy City – that’s the place to go. Napkins, lots and lots of napkins. Click here for instructions on how to fold your own Yoda napkins. It just cannot possibly be easier than that!